I don’t want to get too embroiled in post-election analysis, but I do think the result brings into sharp focus some key strategic questions for activists and campaigners in the UK. I’m drawing here on the theory of social construction in policy design (which I think is highly relevantm, and hopefully more interesting than it perhaps sounds). Taking a long view, one question this theory tries to address is (paraphrased), why some groups end up as the consistent beneficiaries of policy making whilst others are routinely shafted by it. 2/ How they are ‘socially constructed’, as deserving of positive policy support, or not. 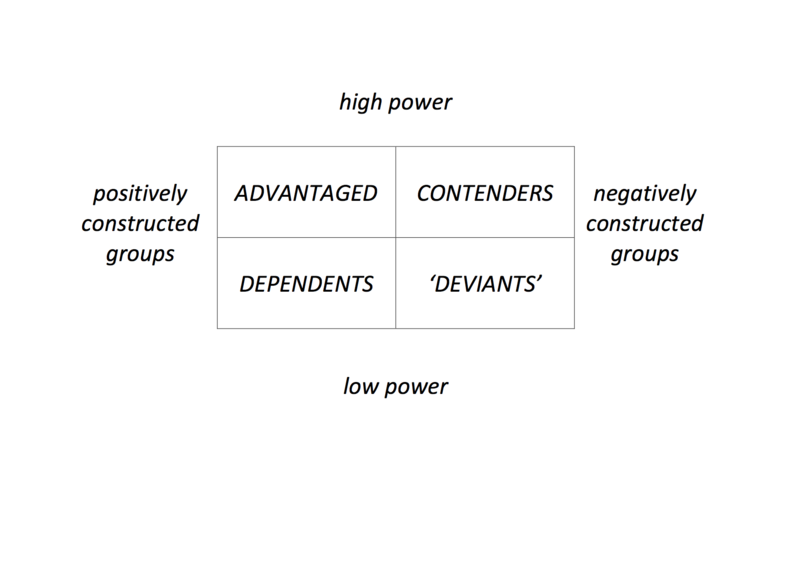 This model explains how relative advantage – and disadvantage – ends up being self-reinforcing. Over time, the social constructions of deservedness and entitlement become amplified and institutionalised. Those who receive policy benefits are well positioned to defend and build on their gains. Their participation is encouraged and incentives continue to be provided. Those receiving sanctions lack the power to challenge their situation, and are without broader support. As a result, they face actions from policy makers that both respond to and perpetuate their disadvantage. So, in this reading, increasing inequality of policy outcomes is hard-wired into the policy-making process. Sometimes things right themselves a little bit. Governments can over-reach, so that advantaged groups are eventually seen as getting more than they deserve for example. Or they may end up threatening a wide sector of groups who may be individually powerless but can collectively instigate effective challenge. It’s quite possible the current government will end up doing both of these things. But waiting for that to happen isn’t what you’d call a dynamic response. So the challenge for those in the sector who work with and for groups who are typically disadvantaged by policy design (i.e. almost all of us) is how to break the cycle. The strategy here is to seek to hold the line, making small gains where possible. The rationale being that the system offers very little opportunity for anything else. It’s a way of mitigating the problem rather than tackling it. That’s a pragmatic response, one which can deliver important results. But I’ve written before about the inherent limitations: without a broader response, the space for manouevre will just keep shrinking. 2/ Support efforts to change the electoral arithmetic. Bolstering voter registration to rebalance policy makers’ electoral calculations is an obvious response. However this is both difficult to implement and only likely to be successful at scale, a tricky combination. This suggests a focus on change to policy making processes rather than (or as well as) actual policies. Change that would create new opportunities for groups to participate in policy making, and new ways to hold policy makers to account. This could be through strengthening the capacity of marginalised groups to engage (beyond/outside just voting) and/or the receptiveness of policy makers to outside voices. Campaigns like ‘Who Benefits?’ have sought to do this, and this kind of broad based coalition approach, I think, should be very much welcomed. There are some great sectoral initiatives providing leadership in this kind of area, such as Common Cause and NEON. For campaigners in NGOs, the challenge in going down this road is that senior managers, funders and boards tend to be (increasingly) keen on quick results. It can be difficult to get support for bolder, long-term visions of overthrowing cultural hegemony. The mantra here is to create your own power by fighting for local solutions and making the connections. On the basis that ‘building a peaceful long term movement for genuine change, outside the boundaries imposed by our current system, is the really important political work’. These aren’t mutually exclusive responses. There’s room for a range of different approaches, and some of them overlap or dovetail. Finding the best ways to maximise the linkages across them.